Traditional folk costumes of Estonia are exceptionally varied and beautiful, and they can range from simple gray felted jackets and long coats from Hargla, to elaborately patterned and ribboned headdresses from Kadrina, to astonishingly brightly colored and embroidered knitted festive stockings from Muhu Island. However, it is the traditional summer costume for a young girl from Hargla that was the particular inspiration for this little toy doll. A summer costume would consist of a blue, red, and white striped skirt, an embroidered belt, a simple embroidered blouse, and a garland of summer flowers to decorate her hair. Annelli is knitted in two flat pieces, with separate arms and legs that are stitched to the body. 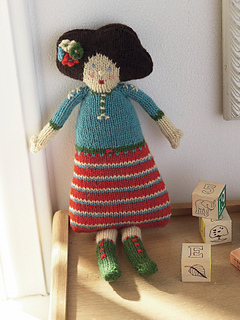 The details on her blouse, skirt, and boots as well as her eyes, cheeks, and mouth are simple embroidery stitches. Annelli also has little knitted flowers stitched onto her hair. I would recommend using a fine pure wool yarn that will felt slightly once washed, creating a nice firm fabric ideal for toys, and a pure wool fleece toy filler.